While being part of a campus group can be one of the most meaningful aspects of student life, hazing is often a hidden but serious problem — one that undermines the value of these experiences and poses the risk of physical and mental harm for many individuals. Although hazing is not unique to SJU, we believe that it is important to examine these practices explicitly in an attempt to overcome the secrecy that perpetuates them. Saint Joseph’s University does not tolerate hazing in any form. The University believes that hazing is contrary to the Christian teaching of human dignity and contradicts an environment of friendship, maturity and charity within its collegiate community. Anyone found responsible for violating the Antihazing Policy, may face disciplinary action from the University, and may also face criminal charges under state law, including The Timothy J. Piazza Antihazing Law, 18 Pa. C.S. § 2801, et seq. Consistent with the Timothy J. Piazza Antihazing Law (Act 80 of 2018), Saint Joseph’s University makes publicly-available this five-year report of Hazing in violation of the University’s Antihazing Policy or state law. This report will be updated each year on Jan. 1 and Aug. 1. In this 17-minute documentary produced by the Clery Center, personal storytelling compels viewers to action. Takeaways include definitions of hazing, examples of hazing practices, and realistic alternatives to hazing that accomplish the goals of team-building and unity. 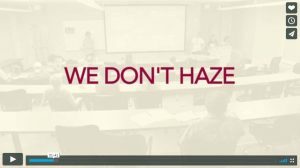 This site is a resource for students, staff, faculty, alumni, parents, and others interested in learning about hazing within student groups at Saint Joseph’s University. Since hazing is a national problem that occurs in high schools, colleges, and other settings, this information may be useful to visitors as well.